Star Trek’s replicators were not only able to produce any food or products our far-off descendants wanted, they were also able to make it from any kind of waste products. 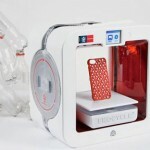 It was the ultimate recycling scenario, one that the new Ekocycle Cube 3D Printer hopes to emulate by using a new filament made in part from recycled plastic bottles. The Ekocycle printer will be available from Cubify for $1,200 later this year, and will use filament cartridges that contain at least three recycled 20 oz. PET plastic bottles, but the material still retains the flexibility and durability of standard 3D printer filament. Unfortunately, because Will.i.am is the Chief Creative Officer of 3DSystems, which has designed the printer, the recycled filament material will only be available in a "curated" color palette of red, black, white, and natural. Limiting, but it’s a safe assumption that other colors will eventually be made available. Posted in 3D Systems, Food. Bookmark the permalink.